I absolutely love this cloffice by Love of Family & Home! She painted and then stenciled the back wall, added scrapbook paper to her magazine files, and added some cute baskets. But look at her desk and shelves. Look closely. Do you see what she did? With the help of her father, she sawed apart an old kitchen table and created the desk and shelves. Brilliant! it was truly my inspiration. I just sold my big house and moved to a small townhouse. I needed a space to relocate my desk. So there was a nitch in the walking closet….so this idea just came to be my solution. Thanks so muchhhhhh for sharing this at Pinterest. What a beautiful and practical space. This is so sweet. I started a project like this in my entry way but it has been lacking “something.” Think I’ll try a strip of wallpaper for my backing. Love the scrapbook paper idea also. YOU have a very very very very very very very very very very PRETTY house!!!!!! WOW!!!!! So many great, traditional porch ideas. I love that folks are trying to get away from orange, but for me, it’s just not fall without some orange in it. Lots of classy looks. I loved the pumpkin pot one in particular. genius! it looks SO cozy. love it. There’s definitely no room for clutter in that clofice. Thanks for finding and sharing. 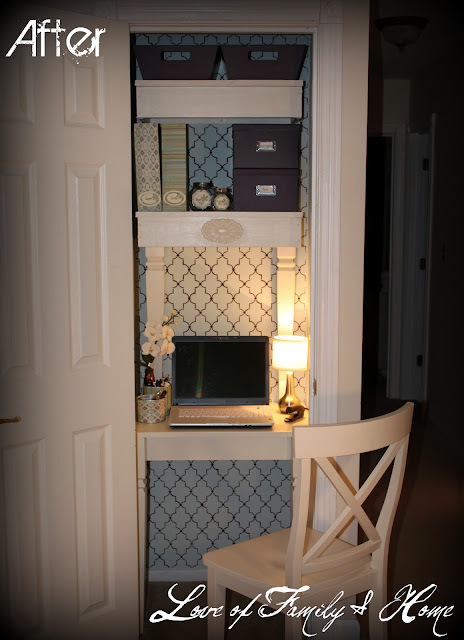 Love this…I want a cloffice! Wish I had an extra closet that wasn’t already jam packed full of stuff. So creative and beautifully done! Very timely as I’m redecorating my office that hasn’t even been painted in so many years I’m embarrassed to say. Thanks for the post! What I great idea! Good find….I’m heading over there to tell her I love it! Thank you for sharing this! We live in a teeny house and can’t seem to find a place to keep our “stuff”… a cloffice could be the answer!